Keep Your Business Facebook Page Alive with Facebook LIVE! 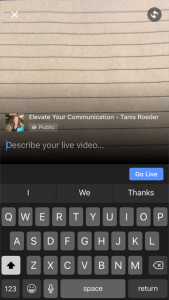 In the ever-changing Facebook landscape, a new feature was just released, Facebook Live! This tiny addition has already created big ripples, adding to the power of social media for business. 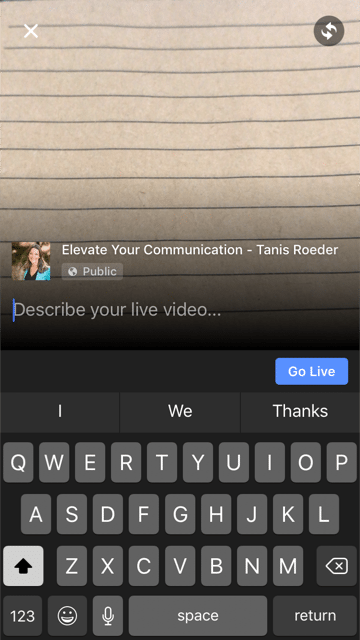 In this article, you’ll find a short tutorial about Facebook Live, how it works, when to use it, and ideas for when to go LIVE! As described by Facebook, Live videos are “real-time” action posts uploaded to an individual’s or business’s page as the recording is happening. These videos are played in follower and friends’ feeds at the moment it’s being filmed. The Live video feeds are also stored on your page, allowing patrons to view the feed later. 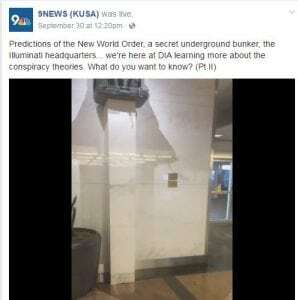 For example, in the picture on the right, the news station 9News went live at Denver International Airport to debunk conspiracy theories regarding the construction and underbelly of the airport. This particular video was viewed over 33,000 times. Facebook Live is a good way to spice up your business’s Facebook page and engage your fans on a new level. It can make your business feel more tangible to customers and a good way to keep your page relevant. When you go Live on Facebook, your fans will get a notification (unless they have unsubscribed from this feature), meaning your fans will likely see this video, giving you valuable face-time with your audience. Using this feature is a highly effective way to generate traffic to your page and potentially produce new business leads. Facebook Live for businesses is designed to work best with your handheld device including phones and tablets through the Pages App. If you haven’t already, setting up your business Facebook page on this app allows you to easily manage your business’s profile, photos, visitor comments, and Facebook Live. Once your business profile is set up in the Pages App, simply open your business page in the app and click the Live button just below the page title and cover photo – outlined in red in the picture to the left. Once you click this button, you may get a message asking if the Pages App can have access to your phone’s camera; click the “ok” or “allow” button to proceed. You may also get a message asking for access to the microphone as well; also click “ok” or “allow” on this message to continue. As soon as the application has permission to continue, you will be directed to a screen with moving video. Before recording begins, you will be given the opportunity to describe your Live video. In this field, add a quick description of what your video will entail, for instance, “ABC Company has new inventory!” or whatever makes sense. The video will automatically start in ‘selfie’ mode so your face will appear on the screen. If you click the two revolving arrows at the top right of the screen, the video will be flipped to display whatever is in front of the camera. If you are not quite ready to begin filming, simply click the white X in the top left of the screen to exit the Live video. Once you’ve added in your description and positioned the camera, click the blue “Go Live” button near the middle of the screen, above the keyboard to begin! You can record live for up to four hours, but we recommend keeping them much shorter, around 5-10 minutes depending on what you are broadcasting. When you are done filming live, simply click the blue “finish” button to end the broadcast. Likes and comments by viewers are allowed in real-time as the video is streaming. Facebook fans can also re-watch or view your video at a later time as your Live broadcast will remain on your page. You can also pay to boost your Live video after the fact so more viewers will see it. In the next blog post, we’ll cover ideas for how to incorporate Facebook Live into your digital marketing schedule.